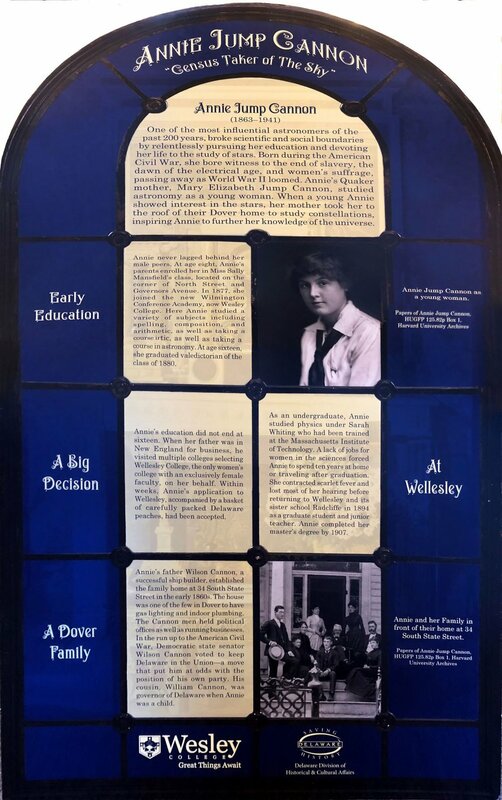 Dover, Delaware - Mayor Robin R. Christiansen, in conjunction with the Friends of Old Dover, would like to congratulate the winners of the Mayor’s inaugural Essay Contest celebrating the life and work of one of Dover’s most famous residents: Annie Jump Cannon (1863-1941). Classifying more than 300,000 stars while she worked at Harvard, she became known as the “Census Taker of the Sky,” and her classification system is still used in the field of astronomy today. The Mayor would also like to congratulate all students who entered the contest and thank teachers, parents, and administrators for their support. Winners will have the opportunity to read their winning essays at an awards ceremony on Saturday, December 8th from 9:30-11:00 a.m. but arrive by 9:00am for a photo op at the Old State House (25 the Green, Dover). They will receive their awards, and any student who submitted an essay will receive a certificate from the Mayor. Short remarks will also be given by visiting New York Times best-selling author Dava Sobel who wrote The Glass Universe about Annie and her associates. This event is free and open to the public. In addition to the awards ceremony, several events have been scheduled to celebrate Annie Jump Cannon’s birthday. To learn more and download a printable schedule of the events (partially funded by a grant from the Delaware Humanities Forum), visit the program website at http://www.parkegreengalleries.com/dava-sobel-featured-writer-during-cannon-birthday/ or contact Project Director Taylor Collins at 302.674.1787. Annie’s house was placed on the historic register a few years ago and in 2017, President and Mrs. Clark received the desk that had been Annie’s when she lived at Harvard. She lived in a small cottage near campus from the account of Margaret Mayall who was Annie’s assistant. It is amazing that you can google earth the location and try to determine where the house is today. This excerpt was from an oral interview on September 12, 1986. Much has probably changed and the large trees that encompass everything make it difficult to discern what is what. In any event, her small writing desk made the journey to Dover and now is in the main parlor of the house. I was able to photograph and sit at the desk and it will be my 2018 Christmas card. I’m including a feather tree and a few decorations to the room. Here’s my initial concept and this will be finished in the next couple of weeks. Hope you check back and see the progress made. Please join us as we honor Annie Jump Cannon, the renowned Astronomer from Dover, as we name our SouthGallery in her honor. “Miss Cannon” will be present for you to meet. We are pleased that Linda Chatfield will be our interpreter as we learn about one of Dover's most famous women. Annie spent her life naming the stars. She was born here in Dover on December 11 and first saw the stars up close with her mother in their State Street home. 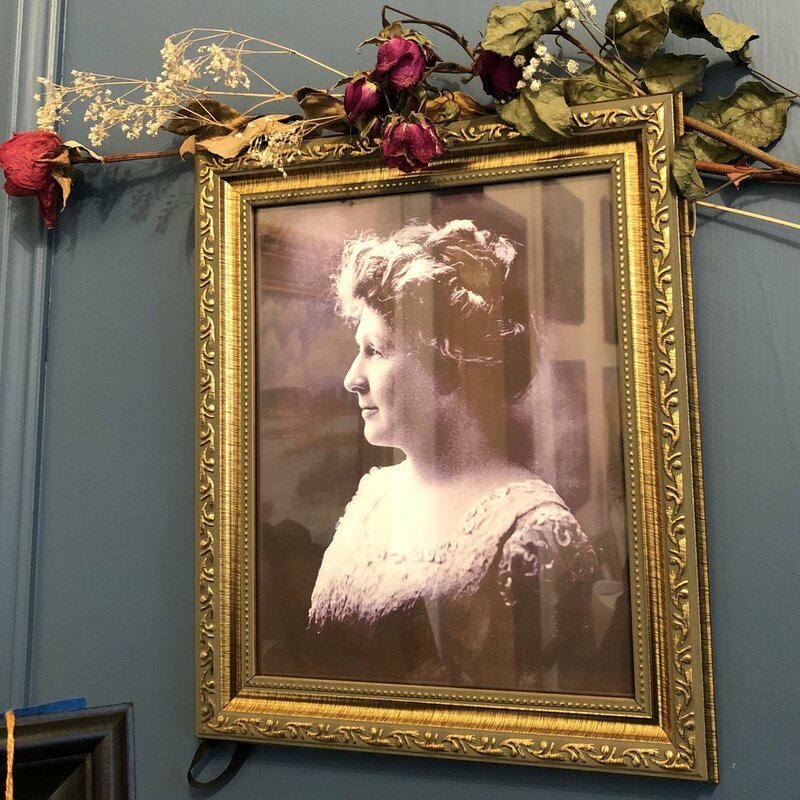 Annie's home was recently placed on the Register of Historic Places and a bronze plaque was installed this year for all visitors to easily locate her residence, click here: 34 South State St. Dover, DE 19901. Annie accomplished amazing feats as a young, hearing impaired woman who made tremendous strides in the scientific field at a time when women were not readily received in jobs or positions outside the domestic arena or normal social roles designated for most women of the era. To learn more about her, we suggest you start with either Wikipedia or this link. Linda Chatfield comes to us with a wealth of experience in additional to being an accomplished artist, whose work you will find in the Mabel Lloyd Ridgely Gallery located in Parke Greene Galleries, she has created more than a dozen living history personae over the past 30 years. Linda has performed as First Lady Dolley Madison, art patron Louisine Havermeyer, abolitionist and author Lydia Maria Child, indentured servants, a town gossip, planter's wife, and sixties diner waitress emerge from time to time in settings like the Baltimore City Life Museum, Baltimore Museum of Art, Hale Living History Farm (Ohio), the Dickinson Plantation. Linda holds a BFA from Boston University and an MS Education from Delaware State University. She has worked as a curator, costumer, educator, interpreter as well as Executive Director of three museums in Delaware, New York, and Maryland. "Miss Cannon" is scheduled to do a short talk at 2:15PM on December 10 during our Gallery dedication and birthday celebration. Check our events page for the full schedule. For information, please call 302.674.1787. Artists are given free rein to explore their views on this subject. This can include interior and exterior views in any medium. As plein air painters we explore the wilds of Delaware quite a bit. This is a chance to let your imagination run wild as well. Abstract expressionist, impressionistic, realistic are just a few of the ways artists interpret the world. Run wild. Have fun with this. Entry Fee - $5 per painting up to 3 pieces. Gallery takes a 25% commission of works sold. (our space is limited so we may have to limit total number we can accept. Please label each work with name, title, medium and price. We can accept small unframed works as well as framed pieces. “In the Night Kitchen” Sendak explores an underlying theme of childhood insecurities. Many of his books delve into real life tragedies and horror. What do you conjure up in your kitchen? What midnight snack or five-course meal do you prepare from your well-stocked artistic pantry? Show us your colorful bounty or your burnt toast. We await your artistic spice. Entry Fee - $5 per painting up to 3 pieces. Gallery takes a 25% commission of works sold. (our space is limited so we may have to limit total number we can accept. Please label each work with name, title, medium and price. We can accept small unframed works as well as framed pieces. Email Taylor at taylor@ntaylorcollins.com or on FB messenger if questions. Please feel free to use this sample press release to help with publicity. The more info we can get out about the show, the greater the attendance. We are seeing an increase in tourists and with the additional publicity the Sendak exhibt is generating, we think attendance will be up. Lunch & Learn February 25, 2016 "The Romance of Journaling by Hand"
Join Taylor Collins on Thursday, February 25 at noon for "The Romance of Journaling By Hand." In a complicated world, it's fun to stay in touch with the analog side of things, to file the digital world aside for a bit. Handwritten journals can hold favorite quotes, fragments of fleeting thought or poems, interior dialogues about questions and answers to life's rewards and challenges. The most exciting aspect of journaling by hand is the self-discovery as you begin to discover the real you, a person you may not know that well. This sampler will preview the basics. Information will be available on workshop and weekly writing sessions. Join the fun. Learn something new. Bring a friend. Free series. Bring your lunch. We supply the water. Learn something new. Call 302.674.1787 Ask for Jan or Taylor.